Delicious Bologna Food Tours | Bologna: la Grassa, "the fat one"
La Dotta, “the learned one” refers to its university, founded in 1088, which is one of the most ancient and prestigious of the world; la Rossa, “ the red one” is a reference to the red rooftops of the historic centre; and la Grassa, “the fat one”. Bologna is one of Italy’s oldest cities. The first settlements date back to the 11th century. It was first known as Felsina, later on, under Romans, it was called Bononia to finally become Bologna. Over the centuries, Bologna has acquired many nicknames: La Dotta, “the learned one” refers to its university, founded in 1088, which is one of the most ancient and prestigious of the world; la Rossa, “ the red one” is a reference to the red rooftops of the historic centre; and la Grassa, “the fat one”. La Grassa is the well-known nickname of Bologna due to its hospitality and of course its delicious food. Bologna has got a huge variety of cibo* and it is because cooking and enjoying a good meal has always been important for Italians, in particular, those living in Bologna. It is part of their culture. Lots of Italian recipes originally from Bologna are worldwide famous and proof the excellence of Italian cuisine. Who, for example, has never heard about the Bolognese sauce, best known as ragú in Bologna? 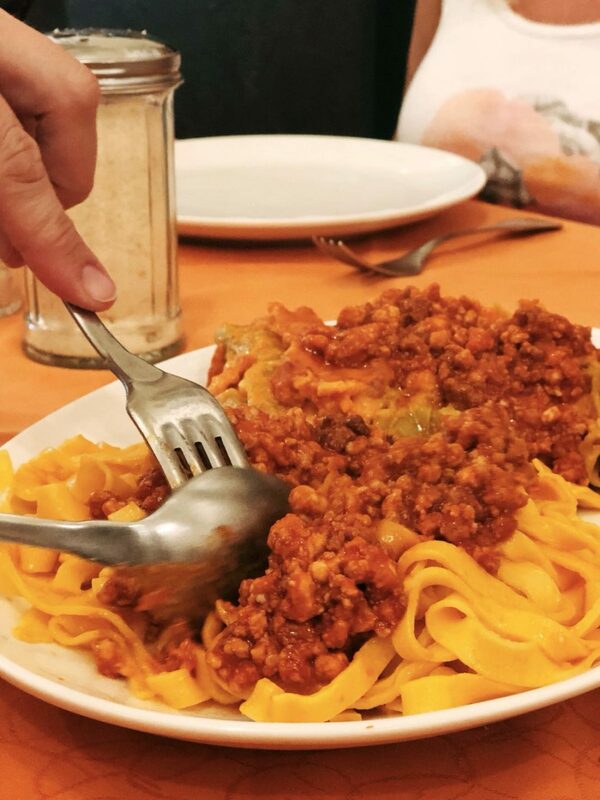 If you have not, you need to come to Bologna right now and try a good plate of tagliatelle al ragú. I can tell you, the best Bolognese sauce can only be found in Bologna. *cibo means food in Italian.